Two military courts in Thailand have sentenced a man to 30 years in prison and a woman to 28 years for insulting the monarchy. The sentences are the harshest ever given under Thailand's lese majeste law, which prevents criticism of the king, Bhumibol Adulyadej. The convictions relate to articles posted on Facebook. Prosecutions for lese majeste in Thailand have surged since last year's military coup. According to iLaw, a Thai rights group, there were only two ongoing prosecutions for the crime before the coup. That number is now at least 56, the group says. Tour operator Pongsak Sriboonpeng, 48, was tried in camera at a court in Bangkok. The judge sentenced him to ten years for each of the six posts he made about the monarch on social media. But the 60-year term was halved after he pleaded guilty. In a separate case, a 29-year-old hotel worker and mother of two was sentenced to 56 years by a court in the northern city of Chiang Mai. Her sentence was also halved after a guilty plea. 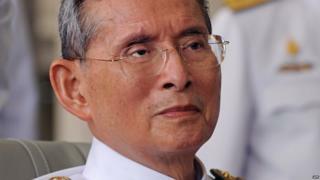 King Bhumibol, the world's longest-reigning monarch, is widely revered but, at 87, is in poor health and is rarely seen in public. Ten years ago, open criticism of the monarchy was almost unknown. But the political polarisation of Thai society since a military coup nine years ago, which was backed by the palace, has prompted some Thais to challenge the official veneration of the king, especially on social media. The current military government, which came to power in another coup last year, has made defending the monarchy a top priority. The law prevents any open discussion of the succession, but uncertainty over what happens when the king dies is causing acute anxiety for many Thais.